For most planting equipment, the spread of the fertilizer and seed bands will depend on the types of seeding points and soil openers used. Narrow points and disc openers will have a small spread while wider shares will give more mixing of the soil so diluting the fertilizer. The width of spread must be checked under field conditions. 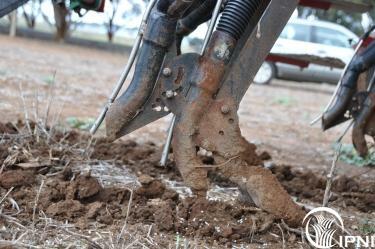 It will vary with air velocity, ground speed, seeding depth, surface residue and other seeding conditions. Figure 1 – calculation of seed bed utilization from seed spread and row spacing. Table 1 – Calculation of Seed Bed Utilization indices for a range of seeding points and row spacings. Seed spread data taken from Deboilles J (1998) Soil bin evaluation of seeding and deep banding equipment, University of South Australia, AMRDC Commercial Research Report.